Chilli Pepper and Cream is a newly built share house that opened in September 2015. The natural wood furniture, industrial concrete floor, and organic touches of plants throughout house make it a very fashionable and refreshing place to call home. The first floor of the house is occasionally rented out for magazine shoots, small events, and co-working spaces. Located in Kagurazaka, an area famous for cultural events, international restaurants, trendy cafes, and authentic Japanese eateries. Conveniently located only a 1-minute walk from Iidabashi Station. This shared house offers 6 private rooms furnished in a simple, neo-industrial style. Happy House Stella is designed with warm and natural elements, creating a cozy atmosphere for relaxing. This share house is located in Zoushigaya, a traditional Japanese area with shady streets surrounded by tall trees, temples, along with plenty of interesting shops and cafes that have stood there for decades. The two nearby shrines, Kishibojin Shrine and Ootori Shrine, hold a craft market on the third Sunday of every month, where you can find unique hand-made accessories, local vegetables, and great souvenirs. 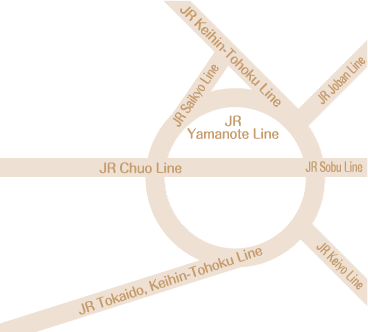 Walk just 10 minutes to Ikebukuro or hop on the train straight to Shinjuku or Shibuya. Ideally located for many things. A large home center, a park and a library are all within a few minutes walk. "Sophisticated but cute” is the concept of this house. Enjoy the herbs planted on the entrance approach. Have a cup of mint tea any time. At this relaxing share house, you can live in Tokyo without the crowds, noise, and high prices and have a comfortable and affordable lifestyle. Small and cozy. Live with an English teacher to improve your language ability.